Erik was at 5:00 hr with the center of the Tropical Storm located near latitude 21.7 north...longitude 109.7 west. That is about about 135 km/85 mi S of the southern tip of Baja California maximum with sustained winds of 50 mph-85 km/h. 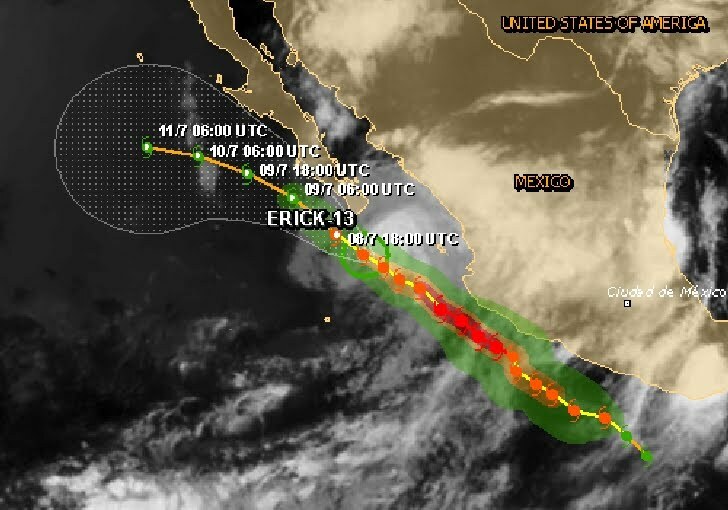 Erick is moving toward the northwest near 9 mph-15 km/h. A northwestward motion is expected over the next day or so with a turn toward the west-northwest expected on Wednesday. 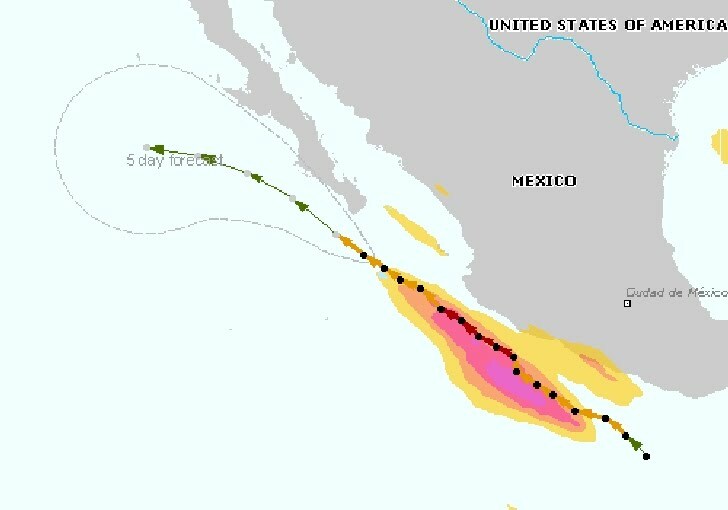 On the forecast track the center of Erick should pass just south of the southern tip of the Baja California peninsula later this morning. Wind: Tropical storm conditions are expected to begin in portions of the warning area in Baja California sur within the next few hours. Rainfall: Erick is expected to produce total rain accumulations of 1 to 3 inches over the southern Baja California peninsula. The map shows the accumulated precipitation along the cyclone's track. Yellow area is > 100mm; Red area is > 300mm; Blue area is > 500mm. The accumulated rainfall is calculated based on the Tropical Rainfall Potential of NOAA/NESDIS. Surf: Swells generated by Erick are affecting portions of the southern Baja California peninsula. These swells are likely to cause life-threatening surf and rip current conditions.